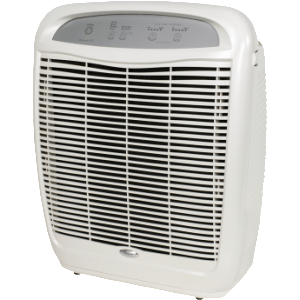 Whirlpool - Whispure : Air Purifier Review • The Air Geeks, reviews of air conditioners, dehumidifiers and air purifiers. Well, here it is. Our review of the best seller, most famous, and pioneering air purifier on the market : the Whispure AP51030K! Introduced to the market by the domestic appliance brand Whirlpool, the Whispure AP51030K is a strong air purifier that is designed for large rooms. This air cleaning system is designed to deliver an impressive air circulation rate to ensure that your room has a full supply of clean and fresh air. This system utilizes highly effective filtration mechanisms and it is capable of removing an impressive percentage of airborne pollutants from the air that goes through it. But why the hype? Well, in addition to being specially engineered to ensure that airborne particles are eliminated before they reach your respiratory system through a three-stage filtration system comprised of a pre-filter, carbon filter, and true HEPA filter, it is economical, intuitive, and quiet. And, best of all, extremely durable. Who want to have to service their air purification unit? The job gets done, and you only have to change filters annually (HEPA filters) or every trimester (carbon). Well, with no further ado, here is what we think of it. Like most air purifiers, this system utilizes a multiple-stage purification process to ensure that most of the air contaminants are removed from the air that goes through it. Air goes through a three-stage purification process before it is discharged. The filtration system consists of a true HEPA filter, a carbon filter, and a pre-filter. The outside grill of this air cleaning system plays the role of a pre-filter. It captures large particles and prevents them from going inside the unit. Large particles that are able to enter through the outside grill of the unit are captured by the carbon filter. In addition to capturing large particles, the carbon filter is also used for eliminating odors. Some particles are small enough to pass the pre-filter and carbon filter. Such particles are captured by the true HEPA filtration mechanism. The true HEPA technology is a highly effective mechanism that captures up to 99.97 of airborne pollutants from the air that goes through this air purifier. Furthermore, this filtration mechanism is optimized to remove even the tiniest particles in the air. According to the manufacturer, this system is capable of capturing minute particles that are as tiny as 0.3 microns. By using a combination of highly effective filtration mechanisms, the Whispure AP51030K is able to remove airborne pollutants of different types and sizes. With this system in your house, you can be guaranteed that the air you inhale is free from common contaminants such as dust mites, ragweed, pollen, mold spores, pet dander, and other irritants. By using this air purifier, you will be freeing your lungs from excessive work. Its “sleep” and “turbo” modes are two intuitive features : they will let you clean the air while you sleep (by lowering power and therefore noise), and while you’re away (by maximizing performance at the cost of noise). Adding to that its 4 fan speeds, the AP51030K adapts very well to any situation you might encounter. 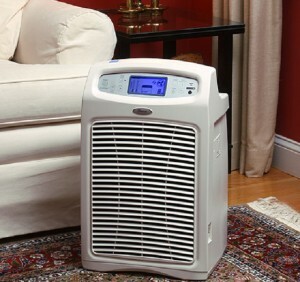 Before you purchase an air purifier for your home, you should consider its suction capacity and recommended room size. If the air cleaner is recommended for small rooms, then it cannot be effective for large rooms. According to the manufacturer, this air purifier is ideal for big rooms and can serve spaces that are as large as 500 square feet. Smoke or pet smells? Gone! In addition, this air cleaning system offers an impressive CADR value of 315. Furthermore, this unit is capable of filtering air at an impressive rate of 4.8 times within one hour : the air is renewed at a faster rate, for you to enjoy it. If you have been tolerating pollutants in your house, then you need to get a powerful air purifier. If your room is large, then this system is ideal for your purification needs. High quality filtration and cleansing of air. This unit comes with a high quality HEPA filter that captures up to 99.97 of airborne pollutants. Very Quiet. This unit is optimized to run quietly. Even the most sensitive users concur that the sound produced by this unit is almost unnoticeable. The unit is therefore an ideal choice for use in bedrooms and other places that require quietness. Generates a little bit of heat. Although this air purifier consumes minimum energy, some users have observed that it generates a lot of heat. When used in small rooms, it can cause the temperature to go up by several degrees. We have used this air purifier for almost a year now. Our living room, dining room and kitchen are open concept. We heat with wood. Add to that the kitchen odors. Add to that we live in Arizona. Lots of dust!! This machine does a very good job of cleaning the air. Since we vacuum the filters every month, we haven't had to replace them. We just ordered new filters since they are days of becoming 1 year old." Can't live without it. Runs quiet for sleeping when on low. Pre-filter extends the life of the Hepa as you can see in my picture. I used to wake up stuffy every morning but not since using the Whispure 510 nightly. It tucks away nicely while on without generating heat or clunking noises. I live in Florida by the mangroves." The hype is well-deserved. The Whirlpool Whispure AP51030K is an exceptional air cleaning unit that is ideal for relatively large rooms. This unit utilizes a three-staged system of highly effective filters to ensure that the air in your room is free from pet dander, dust, pollen, mold spores, and odor to name a few. In addition, this system is designed to run quietly and offers four fan speeds, all bundled in a very intuitive, plug-and-play interface. The heat it emits, in a few cases, is really the only minor underperforming point we noted during our tests. Considering the features and performance of this air purifier, it clearly deserves an excellent rating!